Now DON’T BE SHY. READ THE WHOLE POST & LEAVE A REPLY at the bottom people. I absolutely love to cook. And not in that, “Yeah… I’ll whip you up some scrambled eggs,” kind of “love to cook” way, either. Sure, I can make all of the basics and I often do, but I am a pretty good cook. I am thrilled to pieces when I’m dining at my favorite restaurant and experience something so incredibly delicious that I want to recreate it in my kitchen. Often it works out exactly as I’d hoped. Sometimes it’s not so great, and still other times, I exceed my own expectations and am personally wowed. That’s when I pat myself on the back and proceed to forget everything I did to create the magic. But it’s no small task recreating things you’ve had at one time in a great restaurant. You’ve got to possess some incredibly resilient taste buds with some kind of elephant memory or something. On the other hand, it’s totally possible to wow the people you are feeding, without going all Julia Child on them. If you’ve been reading my blogs for a while, you should know this by now: If there is an easy way, I’m going to find it and do it, if I’m not already doing it. Here’s a hint: This “wowing” is accomplished by cheating. I do this often (also no surprise). Especially when I’m hungry and I run across an item that will provide me the “cheat” I’m looking for. This brings me to the other day. When I came home to cook dinner, I’d been at the market hungry and feeling creative. The plan was to make really great stir fry, but I just wanted a little something extra. I’d perused the aisles and came across frozen Chicken Shui Mai. Do you know what this is, you guys? It’s a little wonton shaped food icon (if food possesses a weird shape, it’s a food icon, like the little twitter bird icon or the little man for “readit”). These are Chicken Shui Mai icons. 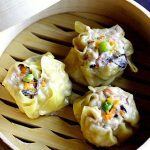 Shui Mai is like a dumpling of YUMMINESS. And the frozen variety usually comes with dipping sauce (I highly recommend it from Trader Joe’s). Ignoring the directions on the package, because, hey – I’ve eaten this stuff. I’ve got this – I whipped out my skillet and sautéed those babies with fresh onion and garlic, a little salt and pepper… It wasn’t long before it was ready to present. I laughed. The guy cracks me up. I can’t help it. Okay. This KILLED me! I was laughing, but I promised to stop making it. It’s no longer known as the breakup meal. It’s been requested for next Tuesday. 4 Responses to "It’s no longer known as the breakup meal"
That was hysterical! Loved it! Ok – I guess I’m gonna have to try this one – but I DON’T think my husband will think it’s a break-up meal – I don’t think he’d have a clue – ha ha! Couldn’t help wondering what Shuimai could mean. Chinese has a paucity of sylables, but shui written ‘水’ means water and mai written ‘麦’ means wheat. Together they might well mean some kind of moist wheat, in this case it seems to be a ‘wonton wrapper’ (used in the recipe in your image link) which can be folded up to a dinky dumpling basket before it’s cooked. I venture ‘大水麦’large shuimai is good for ‘tortilla de harina’. Am back at Coreology as a trial to see if my knee can hold out. The 6-month layoff was devastating, almost a ‘start-over’ sentence. Best to you! Well helloooooo Eaeme! Nice to see you! And of course, you are ever informative as always. Suffice it to say, it was YUMMY. Do NOT forget the YUMMY, Eaeme! Also – I am back TEACHING pilates plus and SPX, so there you go… we’re both back at it. Best of luck to you too!